Is the Flynn resignation a sting? As I’ve said before, I’m generally not into the day to day political gossip. Especially when the mainstream press cries impeachment wolf for the countless time. So when I heard of Flynn’s resignation I initially shrugged my shoulders. But I also take a Trump victory seriously, and I take his pledge to #draintheswamp seriously. There’s lots of slimy things in the swamp that don’t want their precious habitat destroyed, and they fight back. So when my friend Thomas Wictor started talking about how the Flynn resignation was a sting, I started paying attention. This could very well be phase I of Trump’s plan to drain the swamp. And an indication of just how serious Trump is about commmitting to his campaign promises. Thomas’s theory was strung along in 20 tweets. I’ve compiled them in edited form for you below. Oh, and he does some great military and foreign policy research. You should check him out. It was clear that the CIA was telling the media stories about Flynn having inappropriate connections to Russia. Now, imagine Trump as a cop playing a killer for hire. He began ASKING THE CIA IF IT REALLY WANTED TO DO THIS. January 11: Trump announces that he pulled a sting operation and identified intelligence official who leaked information. Director of National Intelligence James Clapper issues a statement opposing leaks. January 23: The OBAMA FBI CLEARS FLYNN OF WRONGDOING in his conversation with the Russian ambassador. Now, the murderous spouse goes ahead and tries to hire the killer. Acting Attorney General Sally Yates warns the Trump administration that Flynn might be subject to blackmail by Russia. Yates bases her warning ON A TRANSCRIPT. She’s the first murderous spouse caught in the sting. She was fired January 31 for refusing to enforce the travel ban. February 9: The New York times and Washington Post claim that Flynn discussed sanctions with the Russian ambassador. The articles are crap. They contradict themselves. This is from the Post. If those intelligence officials have firsthand knowledge, why can’t they tell us a straight story? New York Times. Again, total confusion about what was said. 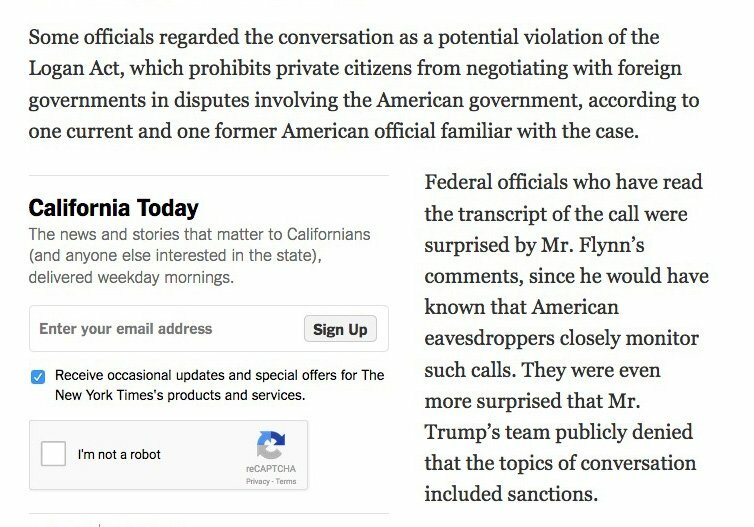 Finally, the proof that this was a sting: FLYNN KNEW HE WAS BEING RECORDED. From the Times. Trump warned, Clapper warned, and the FBI warned, but the CIA went ahead and leaked ANYWAY. Trump, Flynn, Clapper, and he FBI set up the CIA. And now the CIA gets to have its peepee whacked REALLY HARD. Right now a bunch of fat drunks are making deals with the feds to keep out of prison. “The New York Times and Washington Post interviewed over a dozen intelligence officials. All those officials had seen transcripts of Flynn’s conversation with the Russians. Yet all the officials told different stories. A foolproof method of identifying someone talking to the press is to give him a specific story. If that story is published, you know where it came from, because it’s a unique story. Why would the intelligence officials have so many different stories if they read the same transcripts? The only possible answer is that each official was given a different transcript. The FBI cleared Flynn on January 23. The “leaks” were published February 9. So Trump has everything he needs to reform the CIA, NSA, etc.